Mouse anti 5-Methylcytidine antibody, clone 33D3 (MCA2201) used for the detection of 5-meC in Zea mays root tip cells by immunofluorescence. 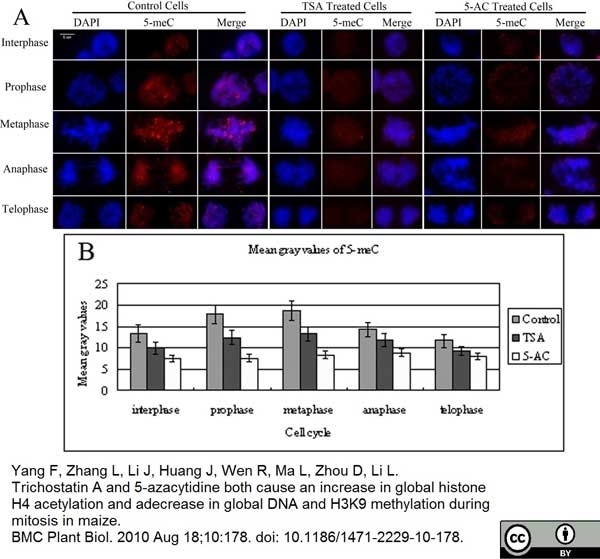 Reduction in 5-meC in TSA- and 5-AC-treated cells. (A) Immunostaining for 5-meC in representative maize root tip cells in interphase or mitosis after TSA or 5-AC treatment. The 'DAPI' panel shows DAPI-stained DNA images, the '5-meC' panel shows immunostained images and the 'Merge' panel shows a combination of blue and green signals. As the untreated control cells progressed into metaphase and early telophase, the amount of 5-meC within mitotic chromosomes increased compared with the amount in interphase cells. The DNA methylation level was reduced in each cell cycle phase after TSA and 5-AC treatments compared with control cells. Bar = 5 μm. (B) Histogram showing mean gray values of the immunostaining signals for 5-meC. The mean gray value of 5-meC signal after treatment with TSA or 5-AC is lower than that of the control. The mean gray values for 5-meC were derived from Additional file 1: Table S3. Error bars represent standard error of the mean. From: Yang F, Zhang L, Li J, Huang J, Wen R, Ma L, Zhou D, Li L. Trichostatin A and 5-azacytidine both cause an increase in global histone H4 acetylation and a decrease in global DNA and H3K9 methylation during mitosis in maize. BMC Plant Biol. 2010 Aug 18;10:178. Mouse anti 5-Methylcytidine antibody, clone 33D3 (MCA2201) used for the detection of 5-meC expression in murine embrryonic tissue by immunofluorescence. Pattern of anti-5meC staining in early preimplantation stage embryos. Zygotes were collected directly from the oviduct 16 h – 25 h after the ovulatory injection of hCG. Images show zygotes at PN stage 1-5 (A1-5) and condensing chromosomes (B1), 2-cell (B2), 4-cell (B3) and 8-cell (B4). Mitotic zygotes stained with non-immune IgG control is also shown (B5). Antigenic unmasking of 5meC (green) was by brief acid exposure. DNA was counter stained with propidium iodide (PI, Red). Images from these two channels were merged to show co-localization (merge). 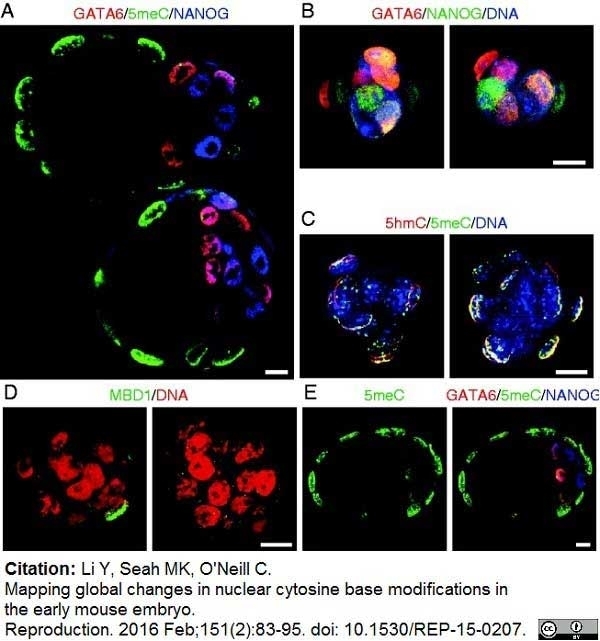 Images of zygotes were single-equatorial confocal sections (0.77 µm), images of nuclei from 2-cell to 8-cell stage were Z-stacks of multiple sections through each nuclei of the embryo. The images shown here are representative of at least seven independent replicate experiments with at least 10 embryos per observation group per replicated. The scale bars are 10 µm. From: Li Y, O'Neill C (2012) Persistence of Cytosine Methylation of DNA following Fertilisation in the Mouse. Specificity of 5meC staining. 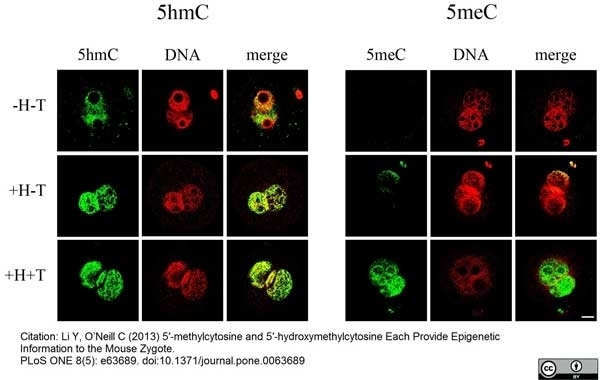 Zygotes at the PN5 stage were antigenically unmasked by combined acid and trypsin pretreatment and stained with anti-5meC as described in Fig 1, (A-C) or stained with anti-5meC in the presence of excess (0.6 μM ) free 5meC (Sigma) (D-F). To further asses specificity staining with an anti-5meC from an alternative source was performed (G-I). (mouse monoclonal to 5meC, used as 1:100 dilution and incubated at 4°C for 18 h; Abcam ab73938). This showed the same pattern of staining as was the antibody used in the rest of the study. Representative of three independent replicates. Mouse anti 5-Methylcytidine antibody, clone 33D3 (MCA2201) used for the detection of 5-meC in murine embryonic fibroblasts by immunofluorescence. The staining pattern of 5meC within nuclei in MEFs. 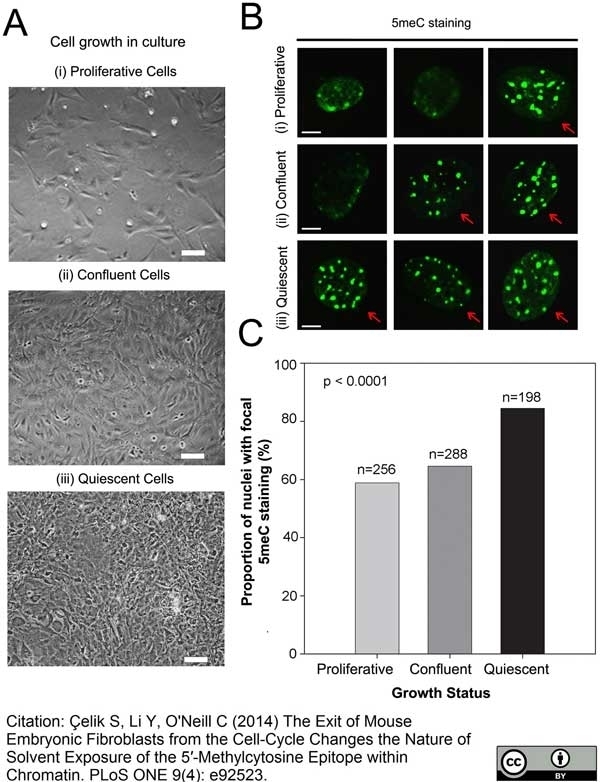 A Phase contrast images of the growth pattern of MEFs in (i) sparse (proliferative), (ii) confluent, and (iii) serum deprived confluent (quiescent) cells. Bar = 20 μm. B Typical examples of the 5meC staining patterns of MEFs in (i) proliferative, (ii) confluent, and (iii) quiescent growth phases. Arrows show cells with a predominantly focal pattern of staining and the other cells show a predominantly diffuse pattern of staining. Scale bar 5 µm. C The proportion (%) of nuclei with predominantly focal 5meC staining in each cell (n, number of nuclei analysed). The focal pattern of 5meC increased with cell proliferation (p<0.0001). The results are representative of three independent replicates. Epitope retrieval was by treatment with of cell with HCl 4N for 10 min at 22°C. From: Çelik S, Li Y, O'Neill C (2014) The Exit of Mouse Embryonic Fibroblasts from the Cell-Cycle Changes the Nature of Solvent Exposure of the 5′-Methylcytosine Epitope within Chromatin. PLoS ONE 9(4): e92523. Staining pattern of 5meC and MBD1 antigens after epitope retrieval acid or acid plus trypsin treatment of confluent MEFs. Fixed and permeabilized MEFs were treated with HCl for 10 or 20A The proportion of nuclei (%) with focal 5meC staining (n, number of nuclei analysed). 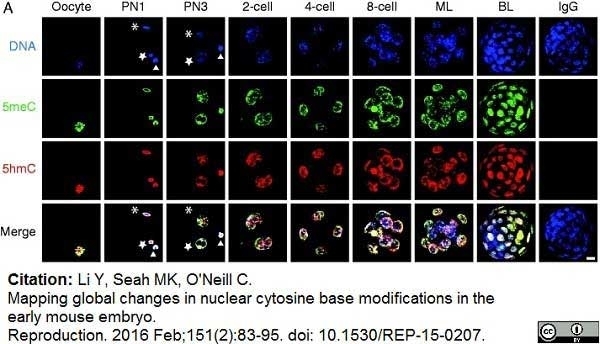 HCl (p<0.01) and trypsin (p<0.01) treatments revealed an increase in the focal staining of nuclear 5meC. 20 min HCl caused no further increase (p>0.05) after trypsin. B Typical examples of focal and diffuse staining of 5meC staining within the nuclei, yellow and red arrows indicate predominantly diffuse and focal staining, respectively. Non-immune IgG control staining is also shown. C The total level of 5meC staining of treatments shown in A. The results are the mean ± SEM of arbitrary units of optical density increased (**** p<0.0001). D The average number of 5meC foci per cell in A. E The average size (cross-sectional area) of 5meC foci in cells in A. F Representative images of MBD1 staining after 10 min HCl and trypsin 0, 1 or 2 min. Blue and red arrows indicate large and small foci of MBD1, respectively, and yellow arrow shows diffuse staining of MBD1. G The proportion of nuclei with focal MBD1 staining increased after 1 min trypsin (p<0.01). H The total level of MBD1 staining (arbitrary units of optical density) increased after 10 min HCl and 1 min trypsin (p<0.0001) Mean ± standard mean of error. Results are from three independent replicates. ** p<0.01 and **** p<0.0001. Scale bar 10 μm. If not shown on individual graphs, the relevant statistical outcomes are stated within the results text. 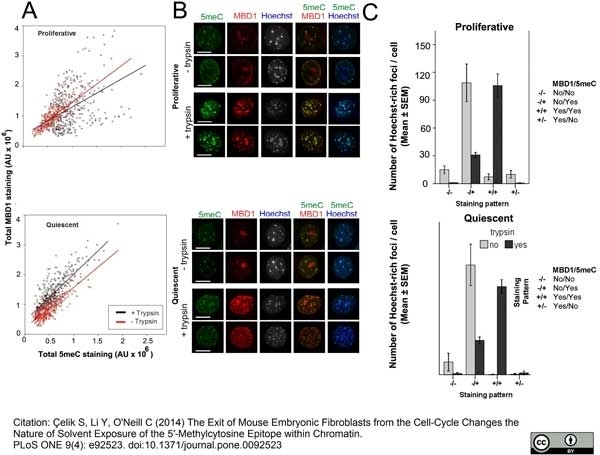 The Exit of Mouse Embryonic Fibroblasts from the Cell-Cycle Changes the Nature of Solvent Exposure of the 5′-Methylcytosine Epitope within Chromatin. The effects of growth status on the pattern of cytosine methylation. 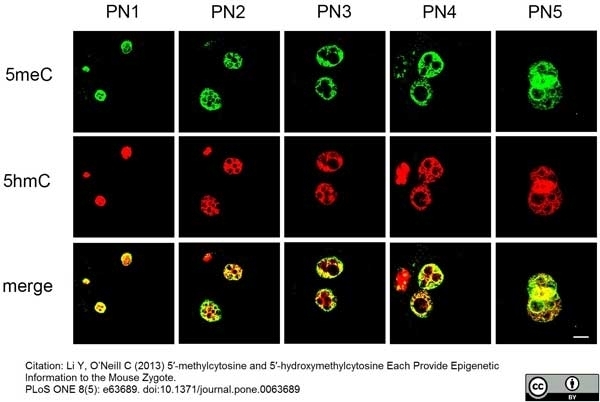 A Proliferative, confluent and quiescent cells at (i) passage 1 (P1) or (ii) passage 7 (P7) were stained with 5meC after 10 min acid (−T) or acid treatment followed by 1 min trypsin (+T). Scale bar 10 micron. Typical diffuse 5meC staining is shown by red arrows. B The total level of 5meC staining. Proliferative (P); Confluent (C); quiescent (Q). Growth status (p<0.0001) affected both the level of 5meC detected and the proportion of nuclei with focal 5meC and the use of trypsin (p<0.0001) affected the detection of those. C The proportion (%) of nuclei with focal 5meC staining. n, total nuclei analysed. Passage # (p<0.0001) affected both the level of 5meC detected and the proportion of nuclei with focal 5meC and the use of trypsin (p<0.0001) affected the detection of those. The results are from three independent replicates. D The effect of treatment of proliferative cells for 24 h with the 5 μM 5-aza-2′-deoxycytidine-2′-deoxycytidine on the level of 5meC staining of MEFs. 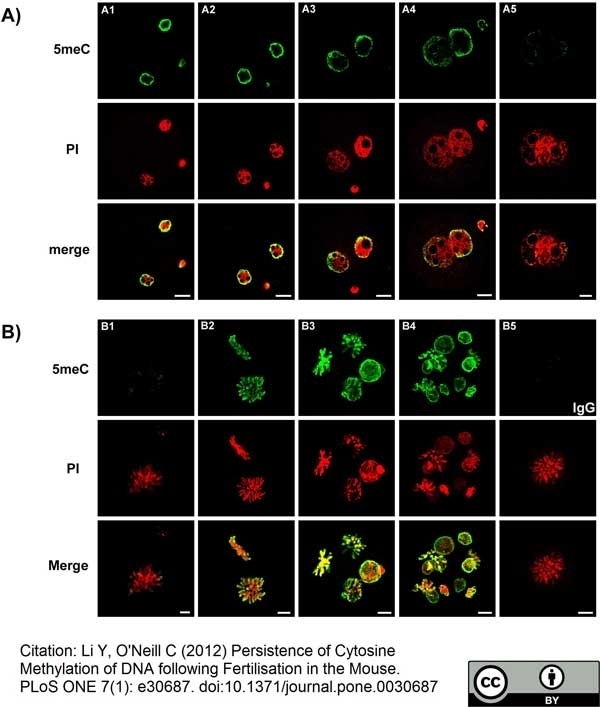 Scale bar = 10 μm E The decrease in the staining levels of 5meC in MEFs after treatment with 5 μM 5-aza-2′-deoxycytidine-2′-deoxycytidine compared to control cells (Untreated) as detected by fluorescence activated flow cytometry (p<0.05). 5meC is tagged with a PerCP-conjugated antibody and detected at fluorescence channel-3. * p<0.05. The effect of cell growth on nuclear staining patterns of 5meC and MBD1. A Proliferative and quiescent MEFs were treated with 10-stained for 5meC and MBD1. The positive association between the levels of 5meC and MBD1 staining was shown for each cell (AU = arbitrary units of optical density). B The localization of these antigens within the same nucleus. Scale bar 10 μm. C The number of Hoechst-intense regions of DNA with different staining defined as MBD1 (stained +, not-stained −) and 5meC (stained +, not-stained −). Those patterns are significantly different from each other (p<0.0001). The results are of three independent replicates. Mouse anti 5-Methylcytidine antibody, clone 33D3 (MCA2201) used for the detection of 5-meC in Arabidopsis suecica cotyledons by immunofluorescence. 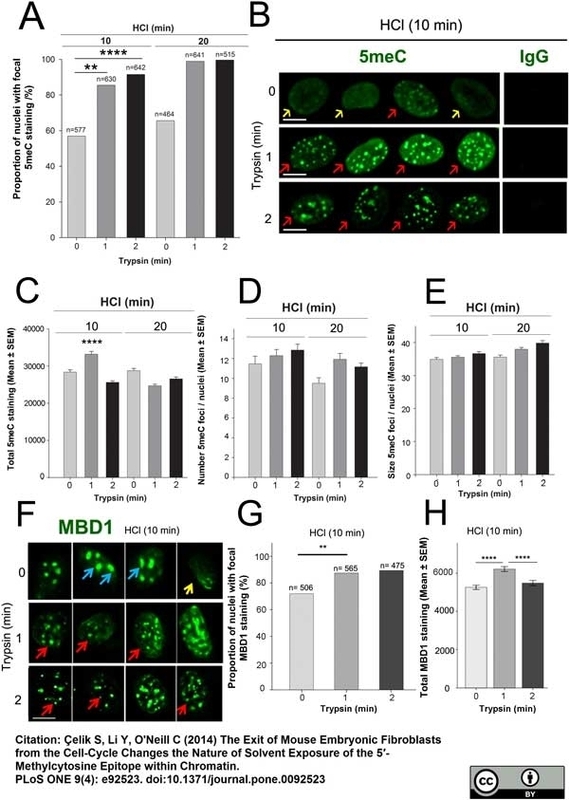 Colocalization of A. thaliana NORs with 5-methylcytosine-enriched chromocenters is disrupted in HDT1- and HDA6-RNAi lines. A. suecica root nuclei isolated from 2, 4 and 15 day-old plants was subjected to simultaneous immunolocalization of 5-methylcytosine (green signals) and DNA-FISH detection of A. thaliana-derived NORs (red signals). DNA was counterstained with DAPI (blue signals). The size bars denote 5 micrometers. Note the nearly perfect colocalization of A. thaliana-derived NORs with 5-methylcytosine-enriched chromocenters in nuclei of 15 day-old wild-type roots; this fails to occur in the knockdown lines. From: Pontes O, Lawrence RJ, Silva M, Preuss S, Costa-Nunes P, Earley K, et al. 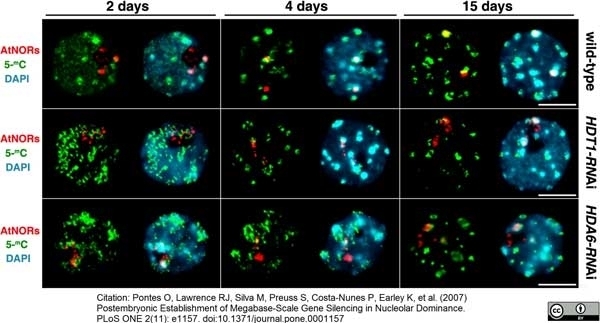 (2007) Postembryonic Establishment of Megabase-Scale Gene Silencing in Nucleolar Dominance. Mouse anti 5-Methylcytidine antibody, clone 33D3 (MCA2201) used for the detection of 5-meC in murine embryonic tissues by immunofluorescence. The effect of antigen retrieval procedures on the detection of 5hmC and 5meC in the mouse PN5 stage zygote. Zygotes were collected directly from the oviduct and fixed and prepared for staining. After antigen retrieval steps, zygotes were incubated with primary antibodies for 1 h at room temperature (5hmC) or 18 h at 4°C (5meC) and each primary antibody was detected by an FITC-labeled secondary antibody. The pronuclei were counter-stained for DNA with PI and the FITC and DNA images merged. Three epitope retrieval approaches were under taken: −H-T, zygotes were not pretreated with either acid (HCI) or trypsin; +H-T, they were pretreated with acid only; and +H+T, epitope retrieval was by a combination of acid and trypsin treatment. The images are representative of three independent replicates. In each case conditions for staining and imaging were managed so that no signal was detected from the non-immune negative control treatments, and these same conditions used for imaging primary antibody staining. The bar is 5 μm and all images are at the same magnification. From: Li Y, O′Neill C (2013) 5′-methylcytosine and 5′-hydroxymethylcytosine Each Provide Epigenetic Information to the Mouse Zygote. The patterns of 5meC and 5hmC staining in each pronuclei during zygotic maturation. Zygotes were collected directly from the oviduct at various times after fertilization and analyzed at the PN1-5 stages of development. Zygotes were subjected to antigen retrieval by both acid and trypsin treatment and were co-stained with anti-5meC and anti-5hmC for 18 h at 4°C. Anti-5meC was detected in the green channel and anti-5hmC in the red channel. The outputs from these channels were merged to show the areas of co-localization. For each primary antibody determined that provided no signal for the non-immune control immunoglobulin and these conditions used for detection of primary antibody. The same conditions for imaging were used for each stage of maturation. The results are representative of 3 independent replicates. Analysis of heterogeneity in co-staining of 5meC and 5hmC in the male and female pronuclei of PN5 stage zygotes. Zygotes were collected directly from the oviduct and fixed and stained as in Fig. 4. Matched male and female pronuclei from individual zygotes are shown. Each image is a 1.03 µm equatorial cross-sectional image of each pronuclei. The image analysis program was then used to measure the optical density of staining of each antigen along the plane shown by the white line. Each corresponding graph shows the optical density per pixel (Y-axis, arbitrary units) along this plane axis, number of pixels). The green line on graphs shows intensity of 5meC staining and the red line is 5hmC staining along this path. Examples of areas where localized increases in 5meC staining was not accompanied by a similar magnitude increase in 5hmC staining are marked by (X) and accumulation of 5hmC relative to 5meC is marked by (*). Examples of nucleolar precursor bodies are shown by white arrows. The corresponding male and female pronuclei from each zygote were imaged and analyzed under identical conditions. Mouse anti 5′-Methylcytidine antibody, clone 33D3 (MCA2201) used for the demonstration of 5′-methylcytosine in mouse embryonic tissue by immunohistofluorescence. Patterns of 5meC and 5hmC staining in the oocyte and different stages of preimplantation embryo development. 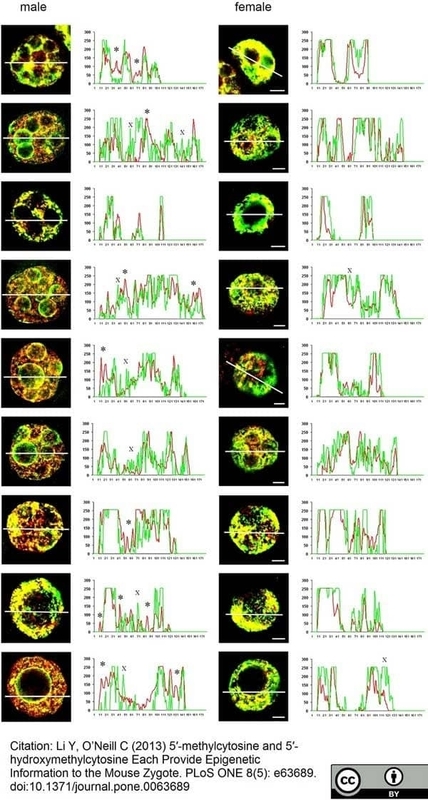 (A) z-stack projection images of staining for DNA (DAPI, blue), 5meC (green), 5hmC (red), and their merged (merge) images in the oocyte; zygote (PN1 and PN3); 2-cell, 4-cell, and 8-cell embryos; morula (ML); blastocyst (BL); and a BL stained with non-immune control IgG. (*) indicates the decondensing sperm head (in newly fertilized oocyte) or the male pronucleus (in PN3 zygote). (open star) indicates a female pronucleus. (open triangle) indicates the extruded polar body. 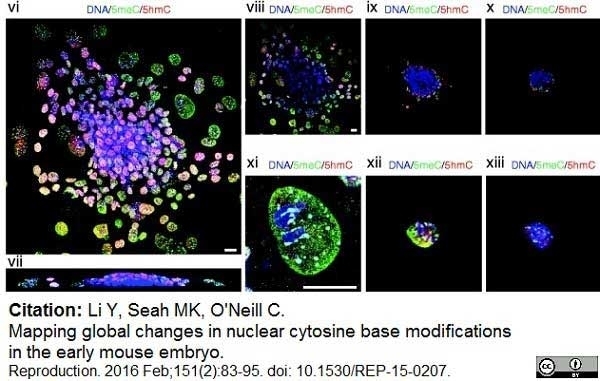 From: Li Y, Seah MK, O'Neill C.
Mapping global changes in nuclear cytosine base modifications in the early mouse embryo. Further validation of differential global loss of methylation from the ICM. (A) Identification of the ICM by NANOG and GATA6 staining. Early blastocysts were triple stained for NANOG (blue), GATA6 (red), and 5meC (green). The merged image is a single equatorial confocal section of two blastocysts. (B) Two isolated ICM stained for NANOG and GATA6. ICMs were isolated by immunosurgery and triple stained for NANOG (green), GATA6 (red), and DNA (DAPI, blue). The images are z-stack projections. (C) Merged z-stack projection of two isolated ICM stained for 5meC (green), 5hmC (red), and DNA (DAPI, blue). (D) z-stack projection of two isolated ICMs stained for MBD1 (green) and DNA (red). (E) A single equatorial confocal section of a late stage blastocyst (98 h) showing either 5meC staining alone or a merged image (NANOG (blue), GATA6 (red), and 5meC (green)). Image shows the resolution of the NANOG and GATA6 staining cells into distinct populations. All bars=10 μm. Changes in 5meC and 5hmC staining in each lineage formed during implantation in vitro. (A) vi, vii, viii, ix, x, xi, xii, xiii, xiv) staining of outgrowths for 5meC (green), 5hmC (red), and DNA (DAPI, blue) of a vi) z-stack projection in the x–y dimension and vii) cross-section in x–z dimension; viii, ix, x) single confocal sections at progressive heights along the z-axis through the embryo shown in vi. xi, xi, xii, xiii) Higher power images of individual xi) TGC, xii) small TB, and xiii) hypoblast cells respectively. Mouse anti 5-methylcytidine antibody, clone 33D3 recognizes 5-methylcytidine, a modified base found in the DNA of plants and vertebrates. Methylation of DNA is an epigenetic process that stably alters the expression of genes in cells as they divide and differentiate into specific tissues. The resulting change is normally permanent and unidirectional, preventing a cell from reverting to a stem cell or converting into another type of tissue. In cancer biology, DNA hypermethylation is associated with gene silencing while hypomethylation is reported to be associated with disease progression (Sincic & Herceg, 2011). Mouse anti 5-MeCyd antibody, clone 33D3 has been reported for use in Methylated DNA immunoprecipitation (MeDIP) (Ponteset al. 2007). Spleen cells from immunised Balb/c mice were fused with cells of the Sp2/0-Ag 14 myeloma cell line. 1Membrane permeabilization may be required prior to staining. Cell pretreatment before staining is described in Giraldo et al (2007)..
Reynaud, C. et al. (1992) Monitoring of urinary excretion of modified nucleosides in cancer patients using a set of six monoclonal antibodies. Cancer Lett. 61 (3): 255-62. Habib, M. et al. (1999) DNA global hypomethylation in EBV-transformed interphase nuclei. Exp Cell Res. 249 (1): 46-53. Hernandez-Blazquez, F.J. et al. (2000) Evaluation of global DNA hypomethylation in human colon cancer tissues by immunohistochemistry and image analysis. Giraldo, A.M. et al. (2007) DNA methylation and histone acetylation patterns in cultured bovine fibroblasts for nuclear transfer. Mol Reprod Dev. 74 (12): 1514-24. Shen, R. et al. (2009) Reversibility of aberrant global DNA and estrogen receptor-alpha gene methylation distinguishes colorectal precancer from cancer. Int J Clin Exp Pathol. 2 (1): 21-33. Pontes, O. et al. (2007) Postembryonic establishment of megabase-scale gene silencing in nucleolar dominance. PLoS One. 2 (11): e1157. Yang, F. et al. (2010) Trichostatin A and 5-azacytidine both cause an increase in global histone H4 acetylation and a decrease in global DNA and H3K9 methylation during mitosis in maize. BMC Plant Biol. 10: 178. Suter, J.D. et al. (2010) Label-free DNA methylation analysis using opto-fluidic ring resonators. 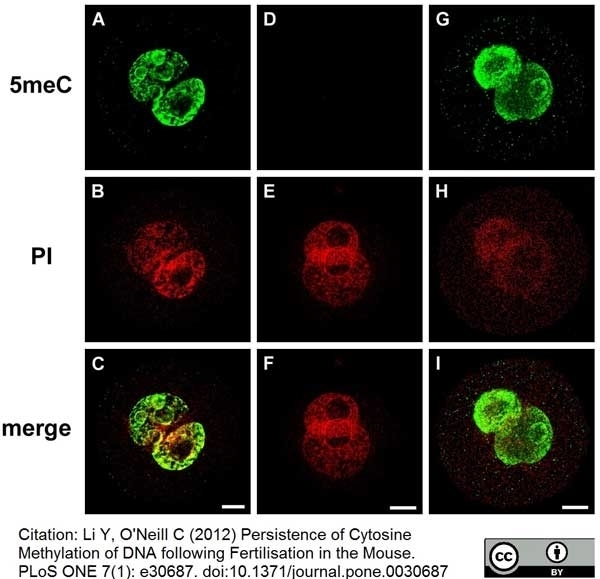 Li, Y. and O'Neill, C. (2012) Persistence of cytosine methylation of DNA following fertilisation in the mouse. Çelik, S. et al. 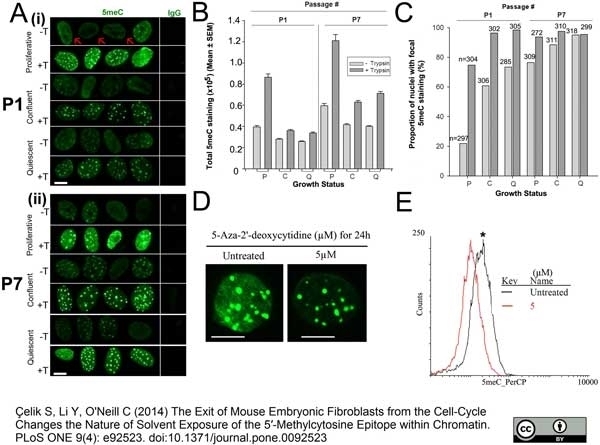 (2014) The Exit of Mouse Embryonic Fibroblasts from the Cell-Cycle Changes the Nature of Solvent Exposure of the 5'-Methylcytosine Epitope within Chromatin. Li, Y. & O'Neill, C. (2013) 5'-Methylcytosine and 5'-hydroxymethylcytosine each provide epigenetic information to the mouse zygote. PLoS One. 8 (5): e63689. Leter, G. et al. (2014) Exposure to perfluoroalkyl substances and sperm DNA global methylation in Arctic and European populations. Environ Mol Mutagen. 55 (7): 591-600. Desjobert, C. et al. (2015) Combined analysis of DNA methylation and cell cycle in cancer cells. Çelik-Uzuner S et al. (2016) Measurement of global DNA methylation levels by flow cytometry in mouse fibroblasts. Li, Y. et al. (2016) Mapping global changes in nuclear cytosine base modifications in the early mouse embryo. Sinčić, N & Herceg, Z. (2011) DNA methylation and cancer: ghosts and angels above the genes. Curr Opin Oncol. 23: 69-76.